Anyone who’s done some computer graphics and 3D modelling knows the convenience of the xyz coordinate system. Any point, line, plane and volume in space can be represented via Descartes’ uniform grid system. To Rene Descartes (1596-1650) we attribute the homogenisation of space that reduces space to “magnitude or extension in length, width and depth,” (122) from which other properties derive. I’ve been catching up with the book Human Space by German philosopher Otto Friedrch Bollnow (1903-1991). It outlines the natural as opposed to the reductive homogenised coordinate system of mathematics. In keeping with the Phenomenological tradition Bollnow starts with space as we experience it. The cartesian system derives from the natural, but is stripped of meaning, significance, symbol, metaphor, and differentiation. Here are some examples of how Bollnow describes the structuring of experienced space. Up-down. In reducing space to axial dimensions, we miss out on various important spatial asymmetries. Up is not just a dimension in a positive direction, with down as a negative. Think of up as above, and down as below. Moving up provides prospect and mastery, in some ways different, if not superior, to what’s below. Right-left. The right-left pairing also exhibits differences. Human societies have to agree on which side of the street we’ll drive, there are bodily asymmetries between right and left, and some loosely formed, arbitrary associations between the right (good) and the sinister (left). Up-down versus right-left. We don’t have a lot of choices about what is above versus what is below, whereas right-left pairings can often be swapped around. In fact when you look in a mirror, right and left are swapped, but not up and down. Front-back. Some people have difficulty telling their right from their left, but rarely what’s in front of them versus what’s behind. Furthermore, when I turn around, it’s clear that what I saw in front of me will now be behind me. I turn “in space” as something fixed around me and don’t drag the whole relational frame with me: “I do not move my space, but I move in space” (46). Front-back versus up-down. But however much I move around on planet earth, the vertical axis remains intact, i.e. we know our ups from our downs. Bollnow elaborates much further, but the point here is that even if we think of spatial experience in terms of an axial system that system is best understood as heterogeneous, rife with differences and asymmetries. As embodied beings, this is the world as we know it. 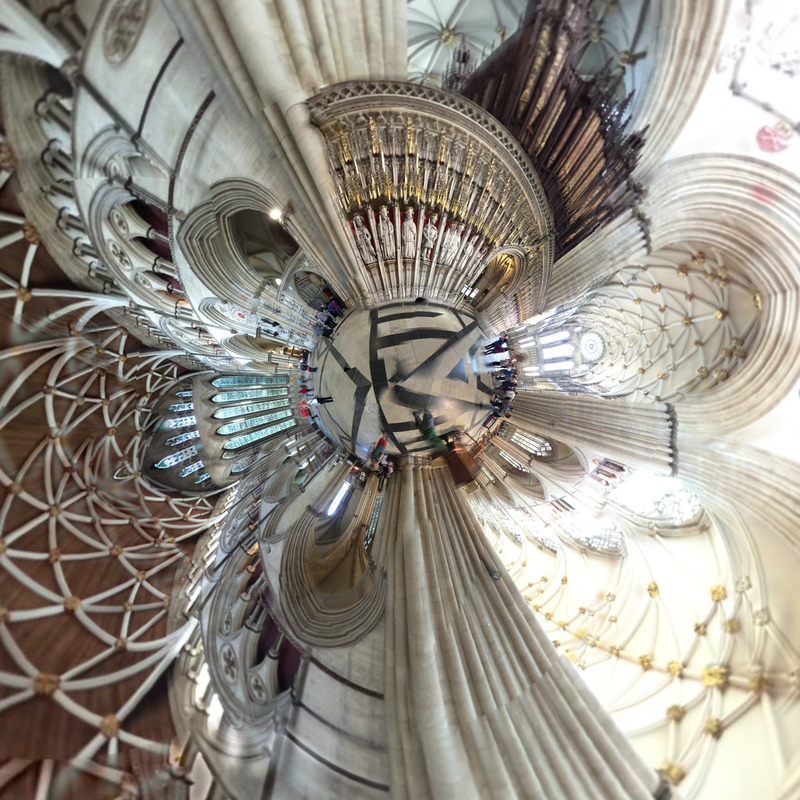 Here is a picture I took inside York Minster a few weeks ago. I used the Occipital 360 panoramic app on an iPhone. I was standing off axis and the image is a full 360 panorama. The east is to bottom of the first picture facing the rood screen with the sculptures of the kings of England. The second image is the same as the first, but mapped by Occipital software swapping the perimeter for the centre. The image is spherical. So the two pictures show the view from inside the sphere from opposing poles. 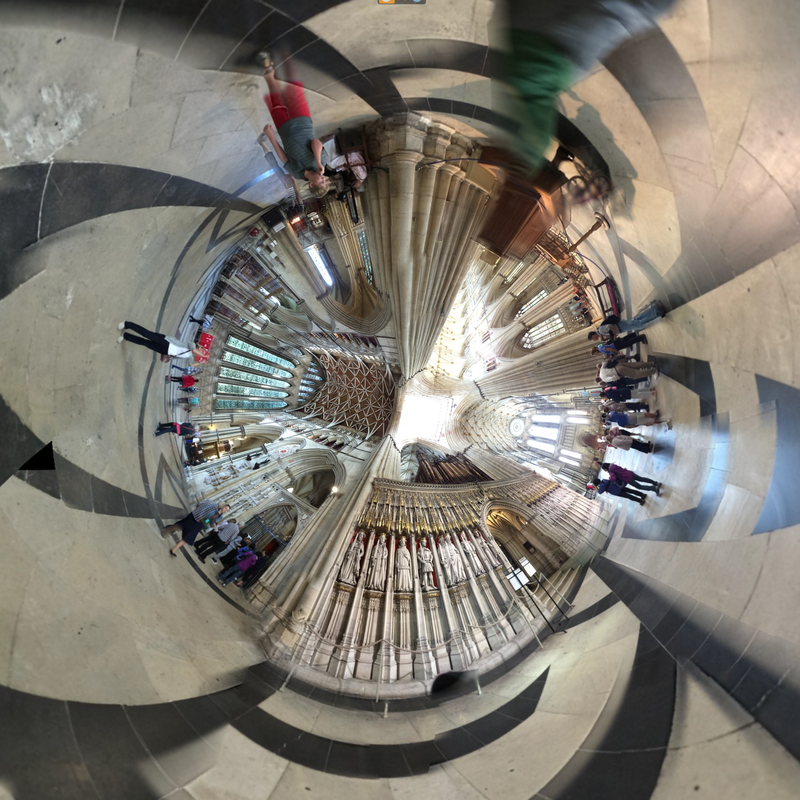 We can thank Descartes for making this kind of algorithmic mapping possible, but the Minster was designed and built on altogether different principles. Click to see the pictures enlarged. « Where does happiness happen? In reaction to dehomogenised coordinates, I am sure you are aware of the sheer computational utility of homogeneous coordinates. The homogeneous representation of an object in n-space is an object in (n+1)-space. So an ordinary 3-dimentional coordinate (x, y, z) is represented by the 4-dimensional homogeneous coordinate (wx, wy, wz, w) where w can be any value other than 0. Practically, homogeneous coordinates allow geometric calculations, such as the intersection point of two lines, to be made without having to consider special cases, for instance if either of the lines is paraxial. At least as far as CAD is concerned homogeneous coordinates are a superior representation of 3D space. Newman W. M. and Sproull R. F. 1979 Principles of Interactive Computer Graphics p 492-501 McGraw-Hill. Thanks Graham. I think you’ve highlighted a terminological issue. Bollnow talks about the homogeneity of space, not homogeneous coordinates, which seems to have a particular mathematical meaning. In fact he doesn’t reference Descartes. I must have picked that up from somewhere else. I’ll keep thinking.